Small-Scale Postharvest HandlingThis manual is available for download (pdf format), free of charge, NOW in 12 languages! Printed copies are also available for sale in our Bookstore in English, Spanish, and Arabic. The links for the free downloads are below. The larger files will require lengthy download times. 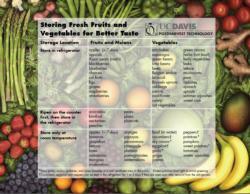 Handy guide for storage of fresh produce. The back of this poster provides more detail about management and safe handling recommendations. Authors: A. Kader, J. Thompson, K. Sylva and L. Harris. This manual1/ provides recommendations for harvesting, handling, storing and marketing a variety of crops in small market conditions in California, other states and other countries. It may be downloaded, free, in pdf format. The larger files require lengthy download times. 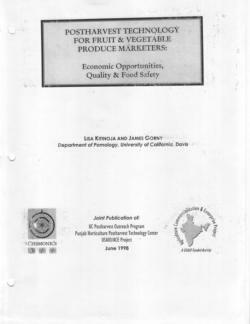 1/A joint publication of the UC Postharvest Outreach Program, Punjab Horticulture Postharvest Technology Center and USAID/ACE Project. 1998.